No Fifth for you » « Guest post: So, should I make poutine instead? This is an utterly extraordinary piece to come from a science editor. Conducting a survey of a subset of a group of over 300, and reporting such a small response, without reporting how many were in the subset is terrible whether judged by scientific standards or journalistic ones. 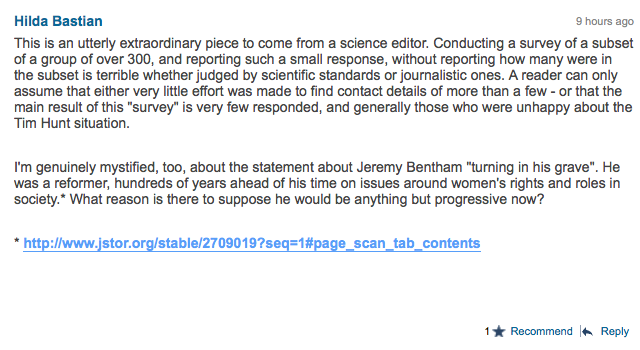 A reader can only assume that either very little effort was made to find contact details of more than a few – or that the main result of this “survey” is very few responded, and generally those who were unhappy about the Tim Hunt situation. I’m genuinely mystified, too, about the statement about Jeremy Bentham “turning in his grave”. He was a reformer, hundreds of years ahead of his time on issues around women’s rights and roles in society. * What reason is there to suppose he would be anything but progressive now? We can assume that about Jeremy Bentham because he is dead and can’t answer. Anyone who answers like this based on his own words is part of the feminist lynch mob witch hunt inquisition, so they don’t matter because they’re biased. There. Did I do it right? Self-selected samples are all journalism’s generally got. Actual studies with actual scientific methodologies – don’t make front page news. More importantly, Bentham cannot “turn in his grave” because his body is stuffed, seated upright, in a large mahogany box. It’s too fragile to withstand a lot of high-velocity rotation. Quite right. Bentham’s resting place is above ground. And his head is not in great shape. So no spinning is recommended.